BOWLING GREEN – In a vote of 2-1, the Gem County, Idaho Commission voted to prohibit the application of the laws of war, including under the National Defense Authorization Act (NDAA), 2001 Authorization for Use of Military Force, and any similar law or authority, in Gem County. One commissioner, even, did it on accident. People Against the NDAA (PANDA) has been facilitating local and state level resistance to the 2012 NDAA for over two years. Founded in January 2012, PANDA has introduced or pushed over 18 pieces of state legislation, including 2014 legislation in Arizona, Idaho, and Wyoming. On the local level, PANDA has helped NDAA Resistance leaders in 4 cities, including the Capitol of New York, prohibit the NDAA’s detention provisions and the laws of war in their city. In the video below, you can hear muffled complaints from the people in attendance, asking to use the upstairs room, the hallway, or another place where they could meet and still see the meeting in progress. The Commission refused. After unceremoniously kicking their citizens out of the meeting, the commission debated sending a letter to Congress as well as voting on the resolution. This resolution, drafted by the Patriot Coalition, would go further than a simple letter in that it would recognize the laws of war, including under the NDAA, as unConstitutional and therefore unlawful in their County. This would prohibit its use, and require local, state and Federal law enforcement to prevent its application in Gem County. Regardless of the actions of the chair, thanks to the leadership of Commissioner Mark Rekow and Jason Casella, the Restoring Constitutional Governance Resolution (RCG) passed 2-1. Chair Bilbao accidentally voted ”yes” on the resolution. While assuming he was voting on a letter to Congress, Chair Bilbao accidentally voted to pass the RCG Resolution. Toward the end of the video below, you can see him completely confused as to his vote, and, after Jason asks if they voted on the Resolution, he doesn’t realize he voted yes on both. Yet he did, and whether by accident or on purpose, liberty, civil rights, and the unalienable right to a fair trial will take hold in Gem County, Idaho. There are many things coming down the pipeline as the national security state, and the militarization of America, continues. But when it comes to the NDAA, 2 years of concentrated effort is starting to pay off. On this issue, at least, the tide has turned in our favor. 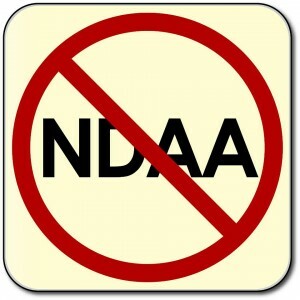 NDAA is passed every year, as part of the US Discretionary Budget, and is mandated by the US Constitution ( Article One, Section Eight). The NDAA Statute of Section 1021 and 1022, in question, notes Public Law 107-40; 50 U.S.C. 1541 ratified nearly unanimousely, (2(D) and 2(R) not voting and 1(D) voted nay). That person has to meet very specific criteria. The author of this article is confusing a commonplace criminal with a prisoner of war who is to be detained, under the laws of war “until hostilities cease”. These prisoners of war fit the criteria of spy, sabotuer, guerilla and terrorist – who are not granted protections under the Geneva Conventions, as conventional fighters, but are classified as illegal enemy combatants or war criminals. Presently, the US abides, to the letter of the law, and our enemy does not.